This is a fresh Swiza knife. This model was shown at the IWA Outdoors Classic 2017. It is a fresh model with the integrated new saw and the model is the D06 in red color. The Swiza knives are taking a step further in the development with this saw. It can be used on wood, bone and several materials. With the SAKs we know that the saw is a multifunctional and versatile tool. It can be used as a serrated blade as well. It was important for me to get a model with this function. From before I have tested the other functions for personal knowledge so I can follow the development. It is important for me to see the construction and design. 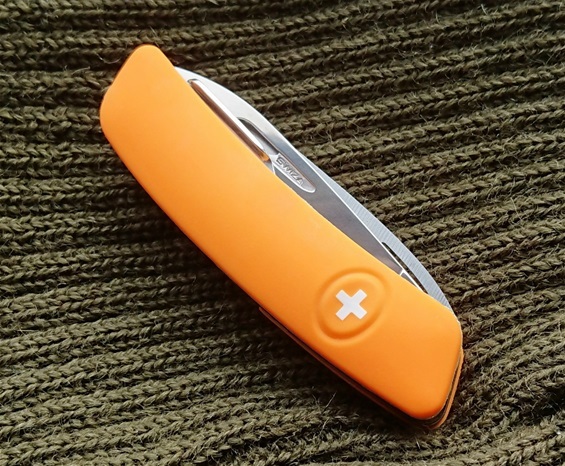 The Swiza knives are small and compact with a very sturdy construction. I will also do some testing for myself to experience how this saw feel when using it. The quality is 100% there so there is no need to worry. 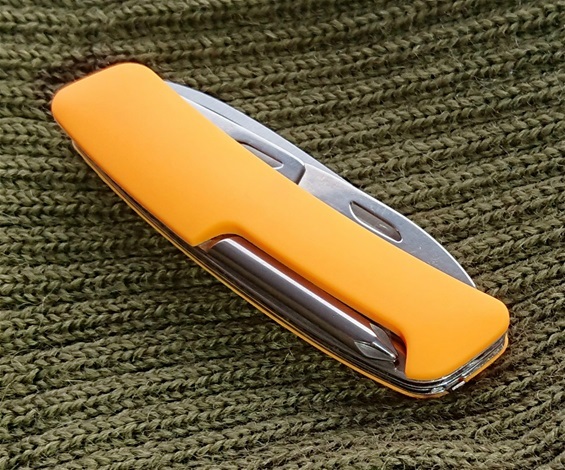 These knives must be heaven for the people that like to carry everything in a pocket knife that they would need in the outdoors and for activities. 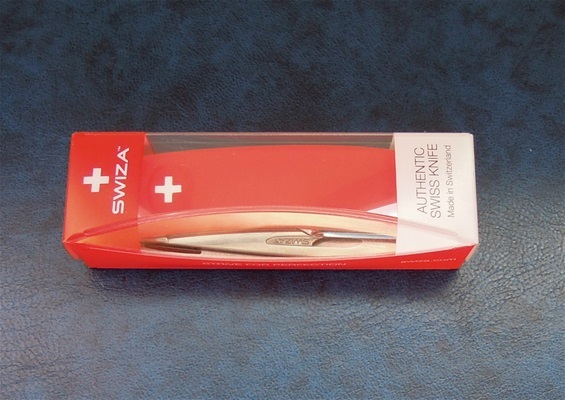 We are now in a time in history with a product that re-invents the Swiss Knife and we are part of a historic development. The lenght of the handle design is comfortable with the ergonomic feel in the hand. The advantage with this is that a short handle allows more layers on the sandwich construction. Because of this layer it is even better in the hand. It can be added another layer and it will be just as safe in the hand. The Swiza knives got many camo systems on the products. I am glad to see the focus on the design appearance is very active. There are more models with the saw for example on the Junior models. On them the knife blade tip and awls are blunt. On the D06 the combination awl, blade and wood saw represents a philosophy that is far more versatile for many materials. The saw will releave the knife blade from the hardest tasks. The length of the saw is 75mm with 70mm serrated. The saw got all the correct design features and it is very solid in design. The back of the saw is sharp and therefor you can use it as a scratching device for tinder. It is very easy to open. "By integrating the saw we are on a completely new level on the Swiza products"
"I can see in the future scissors added to the D06 tool selection. It is also fully possible with pliers and then enter the MT world too"
I did a few simple tests for my knowledge on wood. The saw is very stable during use! It is a different experience compared to traditional Wenger and Victorinox ones. In a way it feels a bit like the type used on the Victorinox 108mm GAK ones that was considered very good. The Swiza saw got all the correct design features for best performance. It is a bit heavy duty and it got a slight downwards curve. One advantage is that the cut teeth on the saw are straight and therefor it works very well both directions. Most modern SAKs got this type of angle on the teeth. Some like the Japan cut angle teeth on them. I prefer this and it is the best for a number of materials in my opinion. Ergonomics is important for the comfort during use. Swiza call it 360 degree design. Anyhow the design on these versatile knives is made to be comfortable no matter of what function you use. If you read and study sakhome.com you have already read my talk about ergonomics and how the comfort is important when using all functions and for the safety. First again I would like to express my thoughts about the knife blade. It is very comfortable to use and it is easy to operate the locking mechanism. It is sturdy too. There is a crazy good bite in wood and because the blade is on the slim side with flexibility you can get very thin shavings as well. I mentioned that the back of the saw is sharp or edgy so it can be used as a scratching device for tinder. It could be on debate if or not it should be rounded to increase the comfort and ergonomics when using other functions. Rounding the edges on the back of the saw is a very simple and easy MOD to do at home if needed and depending on peoples preferences it can be done little or much. It takes very little pressure to cut with the knife blade on different materials because of the design and ergonomics. It helps to apply a firm grip and the angle of the edge is very well designed. No matter what other people may say the choice of steel very much influences the cutting abilities on wood. The edge geometry and edge angle play a big role too. In my opinion if an edge bites well on wood and it is durable + easy to sharpen then it is correct. In other words the Swiza knife blade got all the correct factors. 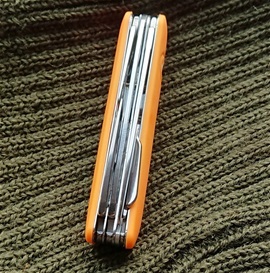 Today i will show my latest Swiza knife and it is a D06 model in orange color. 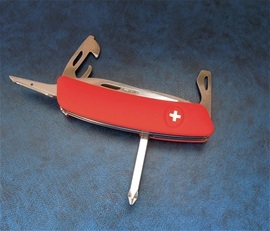 It is a very beautiful Swiss knife. I have only positive information to mention about it. It is very nice. The color is just amazing and it is a test for the camera and program to pick up the shade. 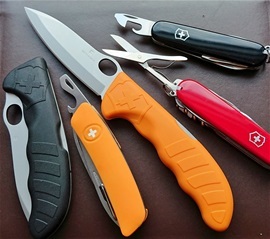 The advantage with large folding knives and fixed blade knives is that they can be used in combination with versatile SAKs and other Swiss knives. In many ways it is so that the correct use say that if you pick a Victorinox , former Wenger or a Swiza knife you can use it for most things. Without a doubt many people can get by with one pocket knife with the functions they use the most. In some situations it can be smart with having combination philosophy like I have talked about here on my page. What is important is that people use quality instruments and learn proper use, care and maintenance as well. It is up to the individual users and it all depends on the use intended. I know many people have the combination in mind even for EDC. Swiss knives are known for the quality and versatile abilities. For rescue, safety or professional outdoors needs having two separate tools can be necessary. 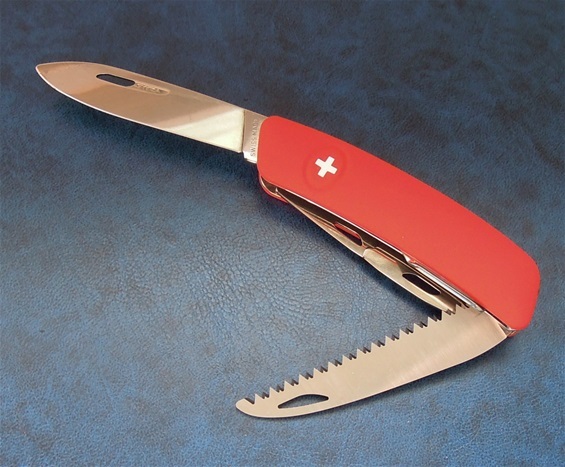 Swiss Army Knives and Swiss knives is a solution for many requirements and demands by both traditional EDC use and for the professional users. The big advantage with smaller categories like on the picture with several functions is many. It does not take much space in the pocket and you have a serious piece of precision instrument for EDC or just as well safety in deed.